Picture this: It is the opening morning of the spring turkey season in your home state, and you have a hot gobbler headed your way. It appears he is on a collision course for the afterlife, when he stops dead in his tracks one hundred yards away and proceeds to taunt you with a barrage of gobbling. If you are like me, the first thing that pops in my head is “something must have hung him up.” Oh, the dreaded “hang-up!” Let’s tackle a few common snags. The worst feeling in the world is to have a turkey headed your way and have him put on the brakes. Where I hunt, thick cover is the culprit more times than not. Turkeys are finicky creatures, and frankly, they do not like briars and brambles. They are just like humans: they prefer the path of least resistance. The key is to eliminate any potential hang-ups before they become reality. The only way to do this effectively is to know the terrain as well as the turkey does. You must know exactly where he is and what is between point A and B. If you do not know the area, you can still adjust on the fly if the gobbler hangs up. Wait for him to drift away to reposition on him. Rely on a locator call while moving to keep tabs on where he is. Then get into a spot where there is no reason for him not to come in and bag him! In the southeastern United States, a common problem many hunters have is turkeys being across a body of water from them. On my property, we have a small river that forms our boundary, and as a result, it creates a number of "hang-ups." Additionally, numerous sloughs and creeks stem off the river, so the hang up problem multiplies. However, all hope is not lost. These bodies of water are a part of the turkeys' home range, and therefore, they are accustomed to flying them to get from place to place. In reality, they aren't a hang up if you approach them right. The key (as with every hunt) is the set-up. Everyone wants to crowd the bank, hoping to get a shot if he walks on the other bank. This usually doesn't work well. My tip: Get 60-100 yards of the bank! Get tight with the bank and the turkey will want you (the hen) to fly the body of water. This has worked wonders for me personally. To jazz up this tactic, I will sometimes (if the turkey is far enough off the other bank) get right on my bank and get the turkey fired up, and then fall back to a set-up 60-100 yards away. It’s something about a hen heading the other way that ticks them off! My father and I used this tactic to call a longbeard across the Tombigbee River (about 400 yards wide) a couple of years back. Remember: do not crowd the creek bank! Have you ever wondered why military forts are built on high ground? It does not take a West Point graduate to figure out that the army that controls the high ground controls the countryside. The same applies with turkeys. They rely on their eyes for their survival, and prefer to control the high ground if any way possible. The problem here is that when that gobbler is strutting on that ridge, and you are below him, he has a huge advantage over you. All he has to do is periscope his head over the crest of the hill just enough to get a good view of what’s below and not enough to get shot before deciding whether to take a stroll down the hill. 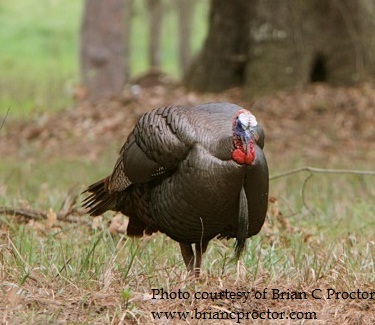 If the role is reversed, however, then you have a huge advantage over the gobbler. That is why I always try to get to the high ground before the turkey does. If the turkey is still roosted, I want to make sure that I will be at the very least eye-level with him when he flys down. If I am out prospecting for a gobbler, then I try to stay on the high ground in case the turkey gobbles nearby and have to hit the deck. Because I am at a higher level than him, I am not put at a disadvantage. I then will be in a prime position to bag a gobbler.